Salna is a spicy, delicious side dish served with parotta in road side hotels of Tamil nadu(Kai endhi bhavan). It is very popular in Madurai. 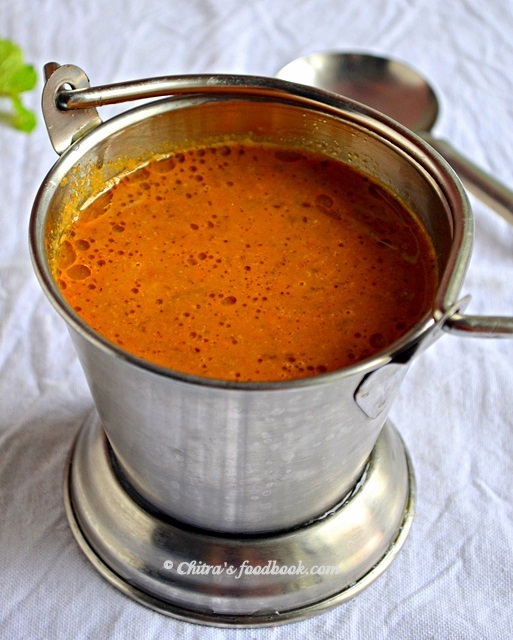 Empty Salna recipe is nothing but a plain, watery, tomato based spicy gravy packed with awesome flavor. 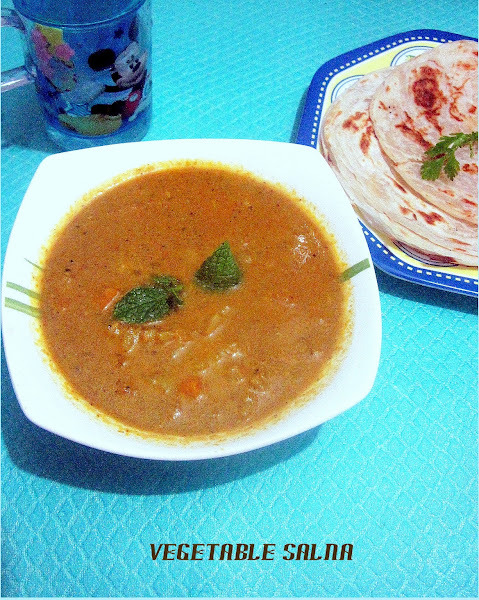 But today I made vegetable salna recipe for parotta. Whenever I think about parota, the side dish that immediately strikes my mind is Salna. This road side hotel gravy is my favorite more than vegetable kurma that is served in restaurants. Nothing can beat this combo. Before marriage, my dad used to buy parotta salna almost twice in a month. We used to buy the parotta just for salna which tastes good for dosa, idli and chapathi as well. So we buy less parotta and ask for more salna ;). My mom makes idli /dosa additionally and we relish the salna with it. Even nowadays when I visit my mom’s place , my lovable dad never forgets to buy this for me. Last week I bought frozen parotta for the first time just to prepare this salna. When I searched for the recipe, I got so many. Finally I made my own by combining all the recipes based on the salna I tasted. Usually in vegetarian salna , you can’t find any vegetables except onions, skin of tomato and a layer of oil floating on top and may be some pieces of cauliflower. I too wanted to make a plain tomato salna similarly. But I added some vegetables just to make it healthy. We loved its taste. Its taste will surely remind road side hotels salna to you. Lets see how to make parotta salna at home. Give a try and let me know how it turned out for you. Hope you will love it like me ;) If you have salna and parotta leftover in hand, you can make delicious kothu parotta too. 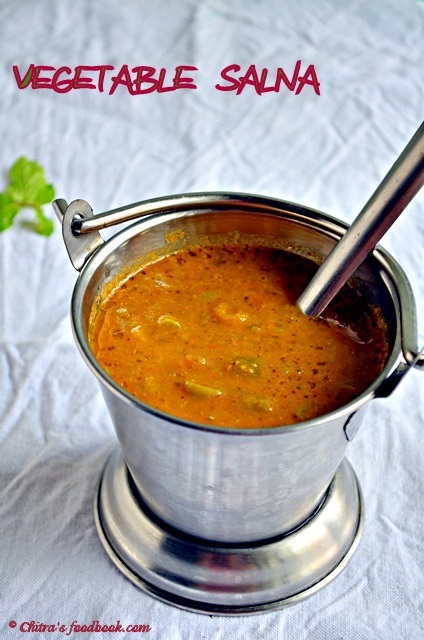 Do check out my Saravana bhavan style Parotta Kurma, Parotta recipe with less oil, Kothu parotta recipe, Tomato kurma and chilli parotta. Cut all the vegetables of small size uniformly. In a kadai , add a tbsp of oil and put cinnamon , cloves , cardamom , fennel , onion , tomato , all powders and mix well till tomato mushes. Then add the grated coconut , cashews .mix well and switch off the flame. After it cools down, add little water and grind to a smooth paste. In a cooker base , add oil and Ginger garlic paste,onions, mint leaves and sauté till raw smell emanates. Now add the chopped tomato pieces and saute well till it turns mushy. Now add the ground masala paste,required salt and all the vegetables. Add enough water and pressure cook for one whistle. When u open the cooker , you’ll see a layer of oil floating on top and u get a nice aroma. If u feel the water is more , allow it to boil for sometime by simmering the flame which makes the oil separate. Serve hot with parotta !! If you want the salna to be watery , add little more water after opening the cooker and allow to boil. U can also add coconut milk at the end instead of grinding coconut . 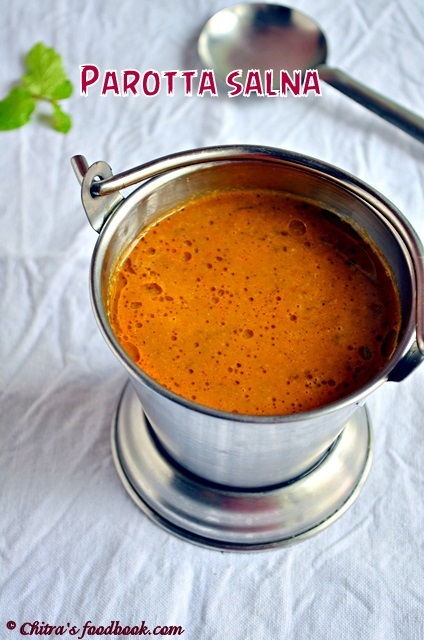 For variations , try adding all the masala while sauting instead of grinding part. Adjust the amount of chilli powder according to your taste. You can even add it at the end and boil for sometime if required. I too love salna..looks perfect...yummy looking!! Delicious salna..I wanted to give this a try at home..Never tasted it though..But now I can blindly follow your recipe..Im sure it will be a hot at home!! Very nice and tempting recipe. Though i have heard this never know how to make this. Love the gravy,looks so tempting. Is salna similar to salan that we get in AP? A watery concoction that goes well with biryani. At least all major eateries serve it here. And as you say there are no vegetables in it at all but yet it is a great accompanying dish. I can have two more parottas with this salna,fingerlicking excellent side dish. I too love salna very much than parotta:) You did it nicely. Yummy! I never had this kind of salna...Sounds good. Tried out and it turned out yummy. hi i made this salna for parotta. parotta came out some what ok. but salna tasted excellant.the taste, consistency ,flavour everything came out very well. thank u.
Salna is a name I have never heard Chitra...but any accompaniment of parotta has to be good. ive bookamrked and I am going to try this soon. I am new to ur blog. Tried out Salna yesterday with parotta for dinner. Came out really well and it was a big hit at home. Thanks for the recipe. Absolute delicacy! I tried and it came out well!! Thank u for the feedback:) I am glad u liked it ! I have tried your veg salna atleast 6 times without knowing its your recipe. It comes out truly amazing. I have become a expert cook with this recipe. The salna has become such a hit that I make it atleast once a month. My wife has a broad smile the moment I ask if I shall make salna. Excellent way of detailing your recipes makes it easy for me. I do make adjustments in spice level, masala level to suite my daughters taste. 5***** rating for this popular tasty recipe. Keep it up. we had it with dosa too .i ate 3 dosas more than i have . if you are near me i would have def treated u with something ...thanks once again . Tried this recipe today and it turned out super yummy!! thanks much for posting this! I have tried this salna so many times now, but have never left a comment. It's a big win win in my home! It tastes so delicious! Thank You!! Happy to know this :) Thanks a lot ! Looking osum... cud yu tell me can i replace anything for coconut.. i dont get coconut in my place.. Tried your receipe twice...second time, made it as side dish for Biriyani for a big get together, everyone liked it...many of my friends, it went well with parota than biriyani..glad I tried it and it was sooper Yummy. Thank you.